François Roland Truffaut was a French film director, screenwriter, producer, actor, and film critic, as well as one of the founders of the French New Wave (La Nouvelle Vague). In a film career lasting over a quarter of a century, he remains an icon of the French film industry, having worked on over 25 films. As a teenage, Truffaut regularly visited the Cinémathèque Française where he was exposed to countless foreign films from around the world. It was here that he became familiar with American cinema and directors such as John Ford, Howard Hawks and Nicholas Ray, as well as those of British director Alfred Hitchcock. The influential film critic André Bazin became a mentor to Truffaut and offered him a job as a writer for Cahiers du cinéma (est. 1951). Truffaut soon gained a reputation for unforgiving and brutal reviews, earning him the nickname "Le Fossoyeur" (The Gravedigger). Together with Bazin and other writers at Cahiers, Truffaut helped develop the emerging auteur theory and his highly critical 1954 article "Une Certaine Tendance du Cinéma Français" is regarded as a key text. Truffaut was one of several writers at Cahiers — along with Jean-Luc Godard, Claude Chabrol, Éric Rohmer and Jacques Rivette — who moved into filmmaking and his 1959 film Les quatre cents coups (The 400 Blows) became one of the defining films of the French New Wave. Along with Bazin and Chabrol, Truffaut interviewed Hitchcock for Cahiers whilst he was in France working on To Catch a Thief, but found the director disappointingly evasive when questioned about aspects of the auteur theory. 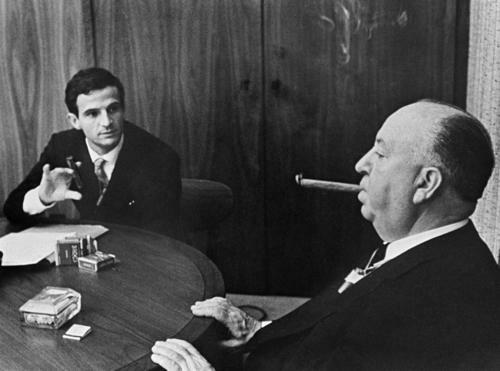 The experience convinced Truffaut that only a prolonged in-depth interview would allow him to breach Hitchcock's defences. During August 1962 and with Helen Scott acting as translator, Truffaut interviewed Hitchcock at his Universal Studios office, recording over 25 hours of discussion to tape. Although Truffaut had intended to quickly publish a book of the interviews, the French edition of Hitchcock was eventually published in 1966, with the England language edition appearing the following year. In American, you call this man "Hitch". In France, we call him "Monsieur Hitchcock". You respect him because he shoots scenes of love as if they were scenes of murder. We respect him because he shoots scenes of murder like scenes of love! Following treatment for a brain tumour, Truffaut died in 1984.